Nerf gun dart tag parties is the new craze sweeping the country. Nerf dart tag is an exciting and exhilarating children’s party experience suitable for girls and boys from 6 years upwards. 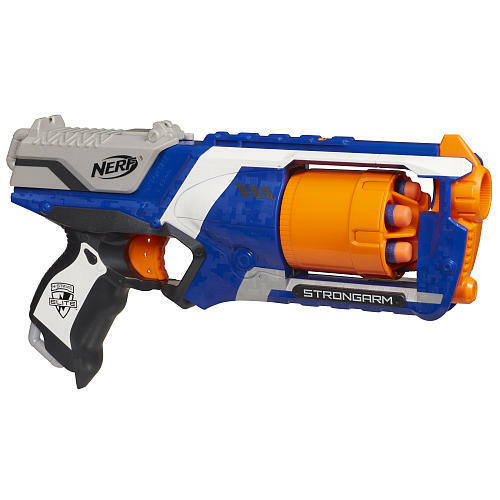 Merry Entertainment organised parties use Nerf N-strike elite strongarm blasters which fire safe foam darts. Camouflage netting provides a battle zone complete with obstacles and tunnel and target shooting games. Coloured bibs are used for team games and all players wear safety goggles. Each hire unit consists of Nerf N-strike strongarm blaster, 6 bullets, goggles and coloured bib. A minimum of ten units must be hired. Refundable deposit: A £50 refundable deposit in cash must be paid when units are delivered. This will be returned when units are collected, less any loss or damage to units. All breakages will be paid for. Loss of items will be paid for. Broken/missing gun £10 , broken/missing darts 25p each, broken/missing bibs £1.50 each, broken/missing goggles £2.50 each. Wear and tear of normal use will be taken into account. All units will be checked and in working order by Merry Entertainment before delivery, and checked again on collection. Guns must not be thrown or used to hit other people/items. Please treat them as you would your own property. Goggles are provided for each child. It is the responsibility of the hirer to ensure they are worn by the participants. Third party damages: Merry Entertainment shall bear no liability for loss or damage to the venue, any third party or their property. It is the responsibility of the hirer to control the participants actions. Do not aim at peoples head or faces; Nerf darts may sting at close range.